Why does Dallas hate trees so much? Walking down Ross Avenue on an errand shortly before lunch yesterday, I came across the scene you see here. 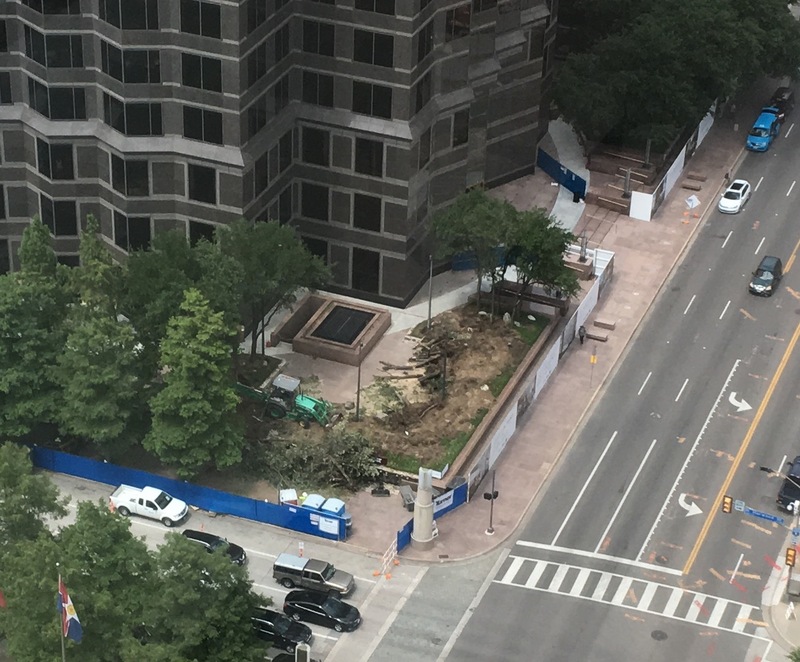 A green backhoe was pushing over a copse of live oaks in front of Trammell Crow Center. The 50-story tower was built 32 years ago, so I assume the trees were close to 40 years old. Why kill trees downtown, where trees are in short supply and desperately needed to make our air breathable and provide shade? There’s a plaza arms race of sorts underway in downtown. The newer towers going up have better designed spaces; some of the older towers are redoing theirs. 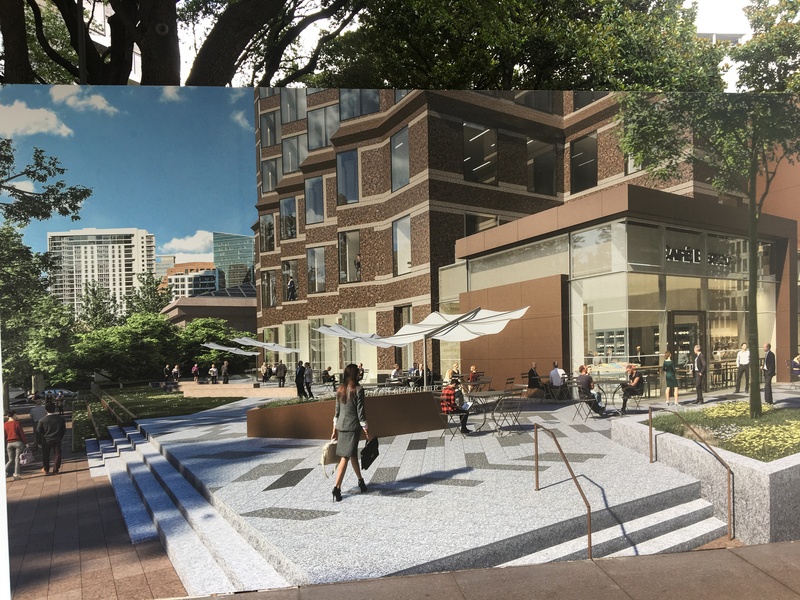 Here’s a pic of what Stream Realty Partners, the project manager owners of Trammell Crow Center, is doing with its plaza remodel. The image you see below is on a construction barrier that faces Ross. It shows the corner of the plaza where the backhoe was working yesterday. There’s a granite retaining wall there now. The above image shows that they are going to remove the wall and bring the plaza down to the sidewalk, to create a better interaction with street life, entice people to visit whatever cafe will one day occupy that corner. Good idea, in theory. In execution, though, it’s a disaster. Stream Realty is destroying downtown’s most precious commodity: SHADE! Notice how the rendering introduces those white umbrellas? That’s not the same thing as 40-year-old oaks. There had to be a better solution. Coming as it does in the wake of two other high-profile tree killings in Dallas, Stream Realty’s tree removal raises questions. Did Stream file an application with the city of Dallas to do this? I’ve contacted four people from Stream, including Ramsey March, a managing director. I haven’t heard back from any of them yet. When and if I do, I will update this post.